The question of electricity market competitiveness is never far away, particularly when any of the Big 6 suppliers raise their prices. The level of concern about potential anti-competitive behaviour by the big suppliers who dominate the GB market prompted an investigation by the Competition and Markets Authority, which reported in June last year. I believe the CMA comments in this regard are relevant and have copied the relevant section below, since the CMA report itself is long. It is widely claimed that the costs associated with environmental and social costs are growing and set to grow further in coming years as the costs of EMR and smart metering begin to impact customer bills. 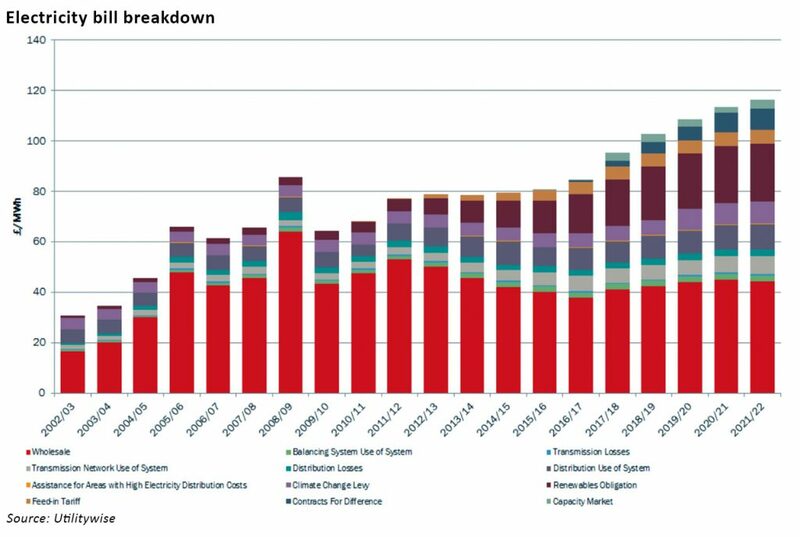 Decarbonisation policies are also leading to increases in transmission costs as the electricity network needs to be substantially re-engineered to meet the challenges of renewable and distributed generation. As a result, the proportion of their costs that suppliers are able to control directly is falling. This will eventually have a significant anti-competitive effect as the benefits of switching to another supplier will become ever smaller. Ofgem requires the Big 6 suppliers to produce Consolidated Segmental Statements to provide the markets with information about their costs and profits. Ofgem also publishes a Supplier Cost Index, developed in response to the CMA’s findings, to provide some illustration of the costs faced by suppliers and their evolution, however, as noted in my previous posts, it is very difficult to draw meaningful conclusions due to the limited granularity of the data. It would be helpful if Ofgem were to publish the underlying data used in calculating the index, as well as the methodology. Much of the focus on this reporting relates to the extent to which the vertical integration of the big suppliers allows them to distort their reported profits through obscure transfer pricing between generation and supply business units, and the significant contribution of operating costs on bills. The inclusion of policy-related costs, should not divert attention from these questions to the extent that policy-related costs remain a small component of overall costs, but when those costs start to form a material part of the overall expenditure, the picture becomes increasingly complex and removes incentives both for the regulator to investigate questions around transfer pricing, and on suppliers to seek efficiency gains. An alternative to recovering the costs of government policy relating to decarbonisation, smart meters, energy efficiency and other measures would be to increase general taxation. This approach has the benefit of removing a significant distorting factor from electricity bills, but has the drawback that it does not incentivise reduced consumption. Although overall electricity consumption has been increasing in recent years, domestic consumption has been falling, and there is evidence of increased use of efficiency measures, with over 80% of homes now having double glazing, 75% of homes with wall cavities having cavity insulation, and 98% of homes having loft insulation. This suggests that further gains may be difficult to achieve as the low-hanging fruit has largely been picked. Ultimately the government needs to choose whether to prioritise having a genuinely competitive electricity market and find other means of incentivising reduced consumption, or whether it will stick with the current system which threatens to make competition obsolete as policy-related costs begin to dominate bills. Either way, far more transparency is needed so that consumers and taxpayers can understand the composition of electricity bills and for regulators to tackle genuinely anti-competitive practices in the industry where they occur. We have observed that there is a lack of shared understanding of the factors that have led to price increases, in particular the relative contribution of wholesale costs, network costs, policy costs and profit. Trusted and transparent information on the costs incurred, and the profits earned, by energy companies may help to inform the public debate and reduce the risk of errors in policymaking, by providing clear information about whether and where intervention is required. It may also help to improve confidence in the regulatory system on the part of policymakers and the general public, which itself may improve the stability of the regulatory regime. The absence of such trusted and transparent information is a potentially material problem, undermining regulatory stability. Parliamentary committees, customer groups, policy think tanks, Ofgem and political parties, among others, have all expressed their dissatisfaction with the status quo concerning the transparency of financial reporting. This is a particular concern given the importance of these bodies in contributing to the general perception of the industry and policy relating to it. Based on our experience, we consider that the Six Large Energy Firms’ current reporting systems are unable readily to provide all the market orientated financial information that regulators and policymakers require. Our view is that improvements could be made to the regulatory framework for financial reporting that would improve the robustness of information available to Ofgem, and hence overall transparency of costs, profits and profitability. (d) there is a lack of a regulatory requirement for clear and relevant financial reporting concerning generation and retail profitability. ← The rise and rise of bills 2: why is it so hard to understand electricity costs?